What tools are available for conceptualizing a utopian future? It could be argued that the field of Utopian studies is overly reliant on literary fiction and, as Ruth Levitas suggests, this allows anti-utopians to easily dismiss such works: “This is the terrain of utopian fiction. It is also the mode anti-utopians like best, keeping the possibility of living differently safely bound between book covers.” (Levitas 2013:197). If literature is “safe” are there other methods for radical imagination that might have more effect? If the field of utopian studies concerns itself with “the imaginary reconstitution of society” (Levitas 2013) then some process of design is required to frame and guide those methods. Specifically, could design-games play a role so that people can design a reconstituted utopian future rather than read about one? One such design-game is Utopoly; a collaboratively developed art research method that addresses the economy and society. Since Hayek’s Road to Serfdom managed to conflate planning with totalitarianism, the use of design in utopian discourse can cause concern in some quarters, suggesting a master-plan or blueprint model. However, Hayek’s concern was with the failure of planning rather than its success. The irony was that a key component of capitalist production was all about planning and rational thought. The scientific management method devised by Frederick W. Taylor in 1880-90s proved the success of planning from a capitalist perspective; so much so that it was enthusiastically adopted by the Soviet Union. It could be argued that the rigid and callous application of rationality to both economics and capitalist production has contributed to many of our modern societal problems and that a more imaginative and generous approach is needed. However, the issue might not be solely rationalism, but also the question of a rationalism from whose perspective and for whose benefit? So, what role can design play in utopian studies and what type of design? Design practice has roots in rationality however the feature most needed now is that of imagination. The evolution of design methodologies from rationality to imaginary has been charted (Lanzara 1983). Taylor’s strict rational approach involves subdividing complex problems into progressively smaller components then recombining into a producing one optimal or “ought to be” statement. In real-life, where problem spaces can be messy, fluid, conflicted and poorly defined, this approach is clearly not appropriate. In order to cope with such imperfect knowledge, the principle of “bounded rationality” was developed (Simon 1969), wherein the designer is a learner and adapter of rules of thumb for “satisficing” with each solution opening up further possibilities. The designer therefore evolves from being a rational homo-economicus to a searcher and learner. But this approach also has limitations. The same patterns are often reused and modified with little chance of affecting radical change (Miller, et al. 1960). Where no ready-made solutions exist, the designer needs to create virtual worlds on a “what if” basis (Schon, 1980), using examples, analogies and metaphors to convey complex relationships and meaning. But these are again based on imagery from the past. A more important and problematic issue lies not with designing solutions but with who decides what is to be addressed and from whose perspective (Lanzara 1983). For the designer, the work is one of constantly framing and reframing problems, by interacting with a range of stakeholders who may provide misguided, deceptive, conflicting or incompatible framings of situations. This disposition toward ‘process’ rather than ‘problem solving’ prevents a “once-for-all” definition or final blueprint solutions. Part of the utopian design role would be to reframe, redefine, challenge, and dispel existing economic and societal myths. Design therefore is “both a process of creative inquiry and construction and a process of political transaction…” (Lanzara 1983:38). Games may appear trivial and have little to contribute to serious practice of design, however, games have been established as a design practice in a number of fields for over 30 years. Huizinga considers how games and play have had a more effective role in cultural development than rational thought, and as Turner suggests, they can provide a function for society analogous to that of genetic variation or mutation. The early Scandinavian design-games (Ehn and Sjögren) were inspired by the Idealized Design method of Russell Ackoff (a systems and organizational theorist). The aspect of play or fun was an important factor in “discarding old mind-sets that inhibit creative thinking” (Ackoff 2010:xii). Knowledge of the present can prevent or constrain creativity, restricting available options to incremental amendments and a continuation of the status quo. This provides an enduring legacy “which leaves the basic structure of society unchallenged and largely unchanged perpetuates the rule of the dead over the living“ (Unger 2013 ). Brandt et al. note particular benefits of board games in design practice. They provide make-believe settings and safe spaces where ‘ordinary laws’ and power relationships can be temporarily suspended. The game’s artifacts can embody a simple framing of the design situation with the constraints of arbitrary rules and features enhancing creativity. Whilst the immersive aspect of the game can also avoid premature judgment which can stymie idea generation. From a participatory design perspective games are also useful. They can encourage collaboration, stimulate imaginative thought and contribute to the communication between designers and users. Having design artifacts (i.e. games) that are familiar to stakeholders adds to the accessibility and democratization of the design process (Holtzblatt and Jones, 1993) as participants are not required to know exclusive terminology, technical details or specific symbols normally associated with design practice. The design-game Utopoly uses two features that emerged from Scandinavian design practice — a Future Workshop and a ‘hack’ of the board game Monopoly. The first part of the Utopoly method is the design process called a “Future Workshop.” Developed by Robert Jungk and Norbert Müllert. The purpose was to allow citizen groups to participate in the decision-making process of public planning. It has three stages: critique, fantasy and implementation. The Future Workshop method emerged as a result of Jungk’s concern that the future was being decided and controlled by a tiny elite from government and big business. It was a reaction to the military and industrial ‘think-tanks’ such as the RAND corporation that emerged during WWII and the Cold War. Technological “progress” was the key aim of these think-tanks, which were powered by the struggle between opposing political ideologies, raising the possibility of further conflict and producing excessive consumerism. There were two aspects to address: the democratic deficiency and a lack of creativity. People were educated for and worked in a capitalist production model, which suppressed people’s natural creativity. As Jungk saw it, through years of deference to others, people had become reliant on experts to tell them what they needed, they had been intimidated and coerced into being mere consumers. This is not surprising when you consider that the second principle of Taylor’s Scientific Management was the intentional removal of any intellectual or creative activity on the part of the worker: “All possible brain work should be removed from the shop and centered in the planning or laying-out department…” (Braverman 1974:78). By completely separating hand and brain activities, imagination was to be solely the reserve of management. There is a huge societal opportunity cost associated with this loss of work-based creativity. Prior to capitalist production most scientific discoveries emerged from craft technique. Craftsmen attended college, engaged in reflection and scientific enquiry and had an intellectual and practical interest in the development of their trade (Braverman 1974: 91). Jungk believed that all people had the potential for genius and wanted to tap into what he saw as the most neglected resource of all: people’s imagination. The imagination necessary to generate positive visions of the future is an ability that has currently stagnated in our modern culture (Levitas 2017). 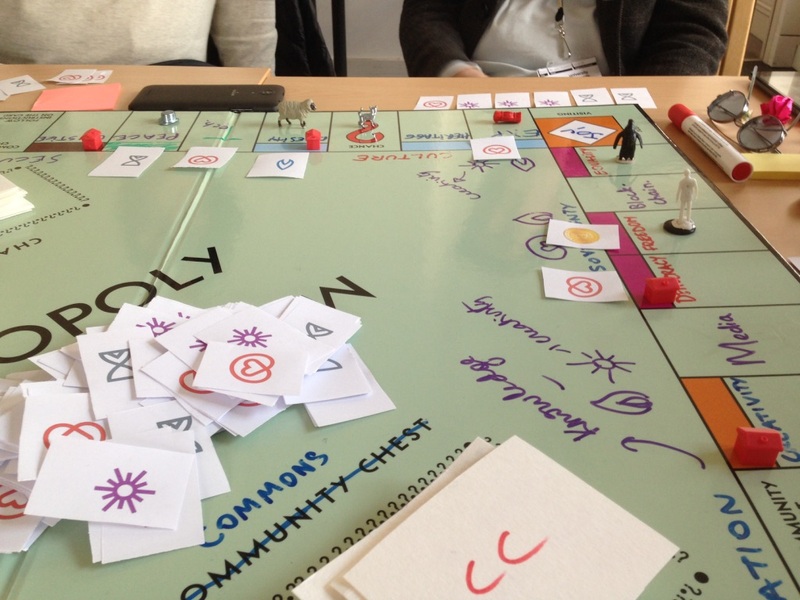 Utopoly uses a Future Workshop to develop ideas for a better society. These ideas are then incorporated into a ‘hack’ of Monopoly. Why use Monopoly? Games are familiar to everyone and the board game Monopoly can be considered a popular cultural artifact throughout the World. The game was invented by Elizabeth Magie and originally titled “The Landlords Game” in 1904. By using the tangible medium of a game Magie had a didactic intention to show how landlords accumulate wealth and impoverish society, she also provided an example of what could be done to counter this inequity. Players could choose either a winner takes all scenario or one where wealth was distributed evenly via a land tax (Pilon). Magie also hoped that children playing the game would have their natural suspicion of unfairness provoked, and maybe apply these ideas in adulthood. It appears that she had an intuitive understanding of what is now known as ‘ inequity aversion’ and a feature of primate evolutionary traits . However, Magie’s version of the game is not the one that is well known throughout the world. The Monopoly we have today has become a celebration of some of the worst aspects of our economy and normalizes activities such as competitive property accumulation and socially useless rentier behavior. Parker Brothers, the games manufacturer, chose to promote a variation adapted by Charles Darrow, who had played Magie’s original version, claiming it as his own invention. Magie was then airbrushed out of history and Parker Brothers constructed and propagated a story about Darrow emerging from poverty in the Great Depression and achieving the American dream by becoming the first game designer millionaire (Pilon, 2015). As a design tool Monopoly is useful because of its familiar format and provides a simplified abstracted model of aspects of the Capitalist economy. It models: financial transactions, banking, rentier behavior, private land and asset appropriation. It also demonstrates the accumulation effect described by Fernholz and Fernholz. Where small incremental instances of initial luck lead to enormous disparities of wealth inequality, even if all individuals start with identical assets and abilities. A similar effect is described by Piketty with regard to ownership of financial assets; such that whenever returns on capital, however small, are greater than general economic growth this will overtime lead to a vast accumulation of wealth. 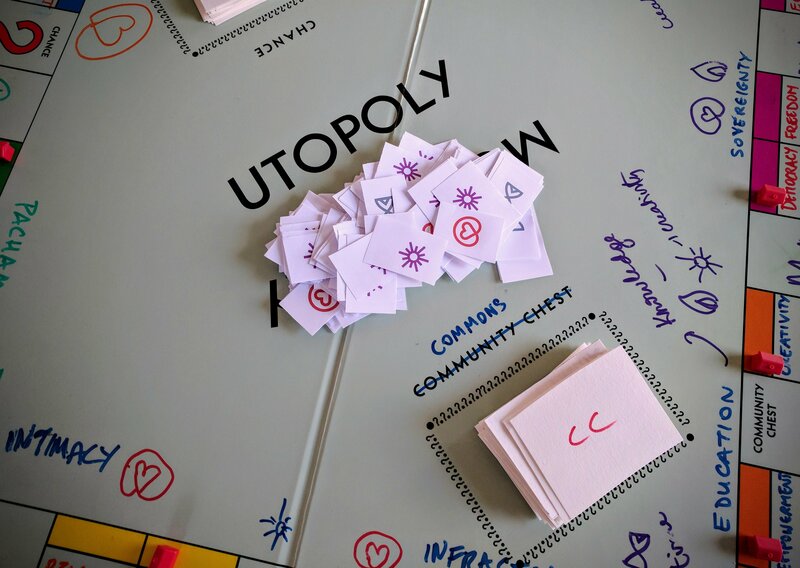 Utopoly gives people the opportunity to both imagine and incorporate values and attributes they would want in a more utopian world. As a ‘hack’ of Monopoly it allows players to determine the properties, the chance and community cards and rules of the game. The generative creative nature of the game means it is constantly being updated however some features that work well get adopted and carried through to the next iteration. 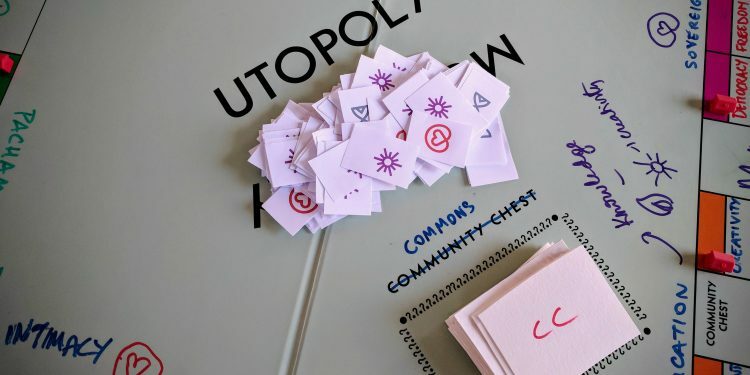 As a method, Utopoly was the outcome of collaborative practice-based action research. It benefited from the cross-fertilization of ideas from events spanning several years and is still developing. A central role was played by Critical Practice the research cluster based at Chelsea College of Art. In 2014 Critical Practice was concurrently working on the event #TransActing: A Market of Values and also ideas for a ‘hack’ of Monopoly. The ‘Market of Values’ was a one-day pop up market held in the Parade Ground, Chelsea. Its purpose-built stalls traded on the theme of wealth beyond capital such as: care, trust, creativity and generosity and forms of exchange that coexist with money but have no cash equivalent. It was envisioned as bustling market with multiple value transactions. The current version of Utopoly is a synergy of aspects of these two projects. The first ‘hack’ of Monopoly occurred at Utopographies, where elements of the game Monopoly were redesigned to incorporate utopian values. This inspired Critical Practice to continue developing the ideas with further ‘hacks’. Some of the ideas and values that emerged, fed into and were represented in the design of the currencies used for#Transacting: A Market of Values. These currencies representing values of: Time, Wellbeing, Knowledge and Creativity, became an integral part of the market experience. They became a device to highlight the very nature of the market itself: the celebration of diverse value relations that have no cash equivalent and the unrecognized values that contribute to society — making intangible value transactions tangible. By recognizing what makes wealth, and selecting values, which co-exist but are excluded from the cash economy it was not just an opportunity to create a local currency but to change the notion of money itself – to use the currency to create and demonstrate an ecosystem of value exchange. A further opportunity presented itself for another ‘hack’ of Monopoly (Utopoly) within the research event ‘What Happens to Us’ at Wimbledon College of Art. This was a participatory event that examined politics within communities and explored the notion of democracy as a system of community formation. The currencies were incorporated within this iteration of Utopoly and changed the nature of the transactions normally associated with Monopoly. A new appreciation and consideration of social relations were exposed, in particular the notion of the commons. It was here that Utopoly as a ‘method’ began to emerge, a method for collectively producing possible futures. A number of iterations have since been convened using a purpose built large laminated board on which empty features and property spaces can be written on with removable whiteboard marker pens to facilitate design adaptations and ease of play. The method of Utopoly has also found a role amongst other researchers. It was at one of these iterations that members of the international ValueModels project from Nice in France, played and found to be particularly useful. They use blockchain technology to record values for institutions whilst detecting positive and negative externalities. The ValueModels project team has been inspired to take the method on and has since run several of their own sessions adapted for their own research and context. They have also contributed to propagating it further afield to be adopted by others. They are developing their own variations under a Creative Commons Licence in the spirit of the P2P Network. One outcome from the research for #Transacting: A Market of Values and Utopoly was the interaction of different currencies (Time, Wellbeing, Knowledge, Creativity) which generated the concept of an ecosystem of value exchange. This research found resonance in the work of economist Bernard Lietaer who highlights the problems of mono-currency debt based economies and advocates for a monetary ecosystem using multiple currencies. In a debt based economy, Lietaer argues, banks create loans which require more interest payments than there is money in the economy, therefore creating scarcity and competition. More loans and growth are then required to meet the debt payments and so on. Bank debt also contributes to cycles of boom and bust: banks amplify problems by lending more when business is good but quickly withdrawing lending at the first indication of change. In doing so, they prevent economic activity, stopping transactions rather than enabling them. An irony of the board game Monopoly is that the winner is ultimately left in control of a non-functioning economy. A more preferable state would be to have a healthy flow of values in balance where people are able to exchange their contributions in a mutually beneficial way. Historical evidence suggests that economies operating multiple currencies are more resilient. They can work in a counter cyclical manner compensating for this withdrawal and allow the economy to keep working. During the Great Depression complementary local currencies such as the Austrian Wörgl, German Wära and the Swiss WIR all succeeded, where the national currency failed. Tragically the Wörgl and Wära were cancelled by the respective central banks, the WIR by comparison is still going strong today. Multiple options exist for complementary currencies operating at levels of sufficiency rather than scarcity and acting as enablers of exchange. Redesigning the monetary system would be a key component of creating a utopian economy. Lietaer (2000:9) points out this is something that is always overlooked: “every modern society – independently of its cultural or political background – has accepted the current money system as self-evident.” The French, Russian, Chinese revolutions, the numerous countries that gained independence, whatever they managed to change they neglected to change money. This was money that was centrally controlled, issued via bank debt, and based on artificial scarcity. Therefore, any utopian society that does not change the monetary system is unwittingly embedding a fatal flaw. Whilst Utopoly is not directly about work there is a fundamental relationship to work and wages inherent within the original model of Monopoly. Monopoly is itself a simplified model of the economy. In Magie’s original game the players collect wages as they pass ‘Go’. They then buy properties and accumulate wealth extracted from other players. Magie was living in a modern industrial state (1904 USA) where people without land or capital had to rely on selling their labour for their survival . She was heavily influenced by Henry George’s work Progress and Poverty and by the Georgist movement, which believed that all nature and land should belong to everyone and that people should own the full value of their labour, whilst land itself tended to accrue unearned value through the community or social capital that surrounded it. The use of currencies from #TransActing: A Market of Values proposed a different value system. Using this currency in Utopoly, players were able to question and reflect on the nature of the economy in relation to the nature of money. A feature that evolved was that players no longer sought to own all the property, but worked together for a common good. In recent iterations, the game begins with the board being set up with a large proportion of properties owned and controlled by a corporate interest, modeling the usual end phase of the game Monopoly. The aim of the game is to then model the transition from monopolistic capitalism to utopia. A feeling of collaborative endeavor is reinforced by the sense of jeopardy as to what would happen if the last remnants also fell to private hands. A key feature missing from our current economic model is the Commons. The economist Elinor Ostrom won the Nobel prize for debunking the myth of the “tragedy of the commons” by demonstrating the benefits and effective use of common pool resources throughout history. In these iterations of Utopoly the new currencies are used to bring privately held properties back into the Commons. Utopoly also allows for more traditional economies presenting the opportunities of gifting and sharing. Money however, has a number of effects on an economy especially with respect to the current abstract separation of paid work from non-paid work and people’s employment dependence. Magie’s model only reflected traditional paid work and offers a land tax as means to rectify the inequity produced by accumulation. So as a model of the economy something is missing. Historically, in less developed agricultural societies, the use of national currencies was generally for interactions with people external to one’s trusted community. Little money was needed in localized interdependent self-sufficient communities. Value was exchanged using intangible transactions based on memory, trust and reciprocal social relationships (Graeber 2011). The imposition of taxation was a key driver of national currencies as a means of exerting power and enforcing the concept of nation states. People were forced to trade externally, breaking them away from their self-sufficient communities. The advent of land enclosures removed access to common-pool resources and the industrial revolution created a further detachment from their communities by becoming reliant on the specialization of tasks for the factory system. Braverman’s research shows the dehumanizing effect of Taylorism in transforming work by removing skills and agency in order to reduce wages and increase profit. This field of Scientific Management developed further in the 1950’s as Greenbaum noted, feeding into the design of computer systems and intentionally excluding workers from the development process. This produced a further alienation and removal of skills. The social contract of long-term employment that existed from 1950-1970s where employers had a responsibility to their employees is disappearing. The theory of the firm meant companies gained efficiencies and value by contractually employing workers over long periods of time. The benefit was found in not having to continually negotiate market rates for individual activities within a company. But as technology makes it increasingly possible to treat people as interchangeable units of production, this factor is removed. Lazonick describes a situation of stable employment, equitable pay with good medical and pension provision in hierarchical corporations, which also included the unionized production workers, as the Old Economy Business Model. From the 1980s a New Economy Business Model was pioneered by IT firms who enticed skilled workers away from secure jobs with higher pay and/or stock options but no commitment for career development or stable employment. Once the commitment was broken the opportunity was exploited to optimize low-wage with high skill in different countries and locations. This model was then adopted by non-IT firms and it was extended to outsourcing, short-term and zero hours contracts. Thus, the future of paid work is becoming increasingly precarious, with workers facing further threats from automation and artificial intelligence. It is also possible that we are entering an age where the old paradigm of technological disruption, which used to create new quality employment as the old jobs were destroyed, no longer applies. “The problem is the sheer abundance of labour” (Avent 2017: 64) whilst some new quality jobs will be created they are not scalable, and low wages will become the norm for the vast global workforce of educated labour. So, whilst the requirement to obtain national currency in order to buy goods, pay rent and taxes remains the same, the opportunity to do so through secure well-paid employment does not. Whilst Magie’s Georgist sentiment required value to be returned to the worker, in today’s knowledge and information based economies it is almost impossible to attribute specific value to a specific worker. This problem applies within a firm and also to the firms themselves. The importance of the social capital that exists within firms and throughout society at large tends to go unacknowledged such that there is a false understanding of the derivation of wealth and value. “Wealth has always been social…no individual can take credit for the system; it was built and maintained by society” (Avent 2017:19). The industrial revolution emerged from a process of cultural development where a complex system of societal networks and institutions provided the fertile ground for wealth creation and accumulation. Much of the wealth extracted by business and private enterprise cannot be directly attributed to them. It relies not only on social capital built up over time but also the input of massive public funding. The economist Mariana Mazzucato documents the substantial contribution of public investment to the success of today’s businesses. And more crucially the vision and direction supplied by government funded and early stage research which takes most of the long-term risk that venture capital is not willing to take. The myth of the success of entrepreneurs and venture capitalists operating in a free market, such as emerged from Silicon Valley, is exposed. With these firms being merely compilers of key building blocks that had been provided by the state. These firms moving in once the risk had been taken to capture the benefits and stands as an example of public risk and private profit. Therefore, these businesses stand not just ‘on the shoulders of giants’, but also on the shoulders of a diverse collective and cumulative effort of society at large. And so, it would be appropriate to develop a new social contract to take this into account. Modern Fintech companies are currently challenging traditional financial institutions by exploiting Blockchain technology and they make much of the term disintermediation, effectively cutting out the middleman. But what is also needed is a new form of ‘intermediation’ where society’s contributions are reconnected and recognised. In this respect, an ecosystem of currencies, which register currently unpaid valuable activities together with a universal basic income could go some way to meet this need. This approach is suggested in Utopoly where people collaborate to contribute values and are valued for their contributions, and where properties and assets are brought into the commons to generate value and wealth for all. The utopian aspect of Utopoly involves releasing people’s imagination as a means of designing a future that they would want to be a part of. Can it also lay the groundwork and plant seeds for socially beneficial expectations and desires? At present, we are forced to endure in a society where the mainstream orthodoxy would like us to accept that ‘there is no alternative’. Most of the changes we are allowed to consider concern our ability to alter our position within a social hierarchy or are technological, superficial and consumerist and yet the fundamental societal problems remain. 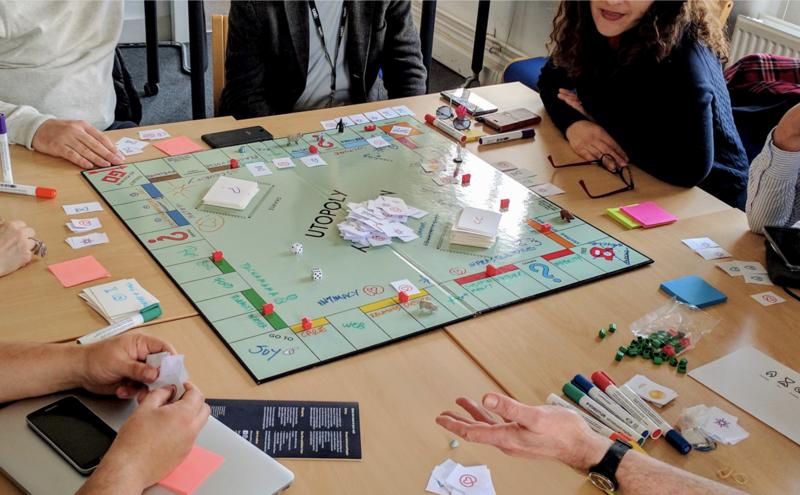 As an example: the design-game Utopoly provided a space for inquiry and reflection to reveal and illuminate the role of money and the associated economic system. These can be considered as some of the last great taboos. If you consider our mono-currency as a technology (Orrell and Chlupatý, 2016) that has been imposed from the top down, it shapes and informs how we behave and the values we are expected to live by. However, it is not just a technology, it has generative features — it drives behavior; it is a strand in our cultural DNA. Money is intrinsic to the way people behave towards each other and how they relate to each other. If we can change the DNA of our economy we could create new exchanges, values and social relations. In financial circles the currency price in a market is often referred to as an information tool but as Marshall McLuhan proposed: “The medium is the message” if we can change our ideas about the information tool we could change the message. Could we change society by changing the DNA of the currency? We have become so used to this abstract construct of a debt-based mono-currency that it is the water we swim in and the box we need to think out of. In order for people to start thinking that ‘another world is possible’ we need to open up a space for imagination to play out. Art, games and play are some of the few remaining arenas available to engage in speculation about the future. By allowing people the space to consider different approaches we can start to encourage better societal norms of exchange and construct new social contracts. Ackoff, R.L., Magidson, J. Addison, J.H. (2010 ) Idealized Design: How to Dissolve Tomorrow’s Crisis … Today. Pearson Prentice Hall, Upper Saddle River. Avent, R. (2017) The wealth of humans: work and its absence in the twenty-first century . London: Penguin Books. Brandt, Eva, Messeter, Jörn & Binder, Thomas (2008): Formatting design dialogues – games and participation, CoDesign: International Journal of CoCreation in Design and the Arts, Vol. 4, No. 1, pp 51-64. Braverman, H., Sweezy, P.M., Foster, J.B. (1999). Labor and monopoly capital: the degradation of work in the twentieth century . Monthly Review, New York; London. Ehn, P. and Sjögren, D. (1991) From system descriptions to scripts for action. In: J. Greenbaum and M. Kyng, eds. Design at work: cooperative design of computer systems. Mahwah, NJ: Lawrence Erlbaum Associates, 241–268. Fehr, E., & Schmidt, K. M. (1999). A theory of fairness, competition, and cooperation. The Quarterly Journal of Economics, 114, 817-868. Fernholz, R. and Fernholz, R. (2014) ‘Instability and concentration in the distribution of wealth’, Journal of economic Dynamics and Control, Volume 44 July 2014, 251-269. Greenbaum, J. (1993). A Design of Ones Own: Towards Participatory Design in the United States Cooperative Design: Techniques and Experiences From the Scandinavian Scene . In: D. Schuler and A. Namioka, eds.Participatory design: principles and practices. N.J: L. Erlbaum Associates, Hillsdale, 27-40. Hayek, F.A. (1999) The Road To Serfdom. Mises Institute. (Accessed: 25 August 2017). Holtzblatt, K. and Jones, S. (1993) Contextual Enquiry: A Participatory Technique for SystemsDesign. In: D. Schuler and A. Namioka, eds. Participatory design: principles and practices. N.J: L. Erlbaum Associates, Hillsdale, 177-210. Huizinga, J. (1949) Homo ludens: a study of the play-element in our culture. London: Routledge & Kegan Paul. Jungk, R., Müllert, N. (1987) Future workshops: how to create desirable futures. Institute for Social Inventions, London. Lanzara, G.F. (1983). The design process: Games, frames and metaphors. In U. Briefs, C. Ciborra, & L. Schnieder (Eds.) Systems design for, with, and by the users (pp. 29-40). Amsterdam: North Holland. Lazonick, W. (2008) The New Economy Business Model and Sustainable Prosperity. (Downloaded: 24 October 2017). Levitas, R. (2013) Utopia as Method: The Imaginary Reconstitution of Society, Basingstoke: Palgrave Macmillan. Levitas, R. (2017) ‘Where there is no vision, the people perish: a utopian ethic for a transformed future ‘, CUSP, 26/06 of posted message. (Accessed: 30 June 2017). Lietaer, B.A. (2012) The future of money: a new way to create wealth, work, and a wiser world . Random House Business, London. Lietaer, B.A., Dunne, J. (2013) Rethinking money: how new currencies turn scarcity into prosperity . Berrett-Koehler, San Francisco. Mazzucato, M. (2011) The entrepreneurial state. Demos, London. Orrell, D. and Chlupatý, R. (2016) What Role Should Money and Markets Play in a Good Society? Evonomics. (Accessed: 24 June 2017). Ostrom, E. (2015) Governing the Commons: The Evolution of Institutions for Collective Action . Cambridge University Press, Cambridge. Pilon, M. (2015), Monopoly’s Inventor: The Progressive Who Didn’t Pass ‘Go’, The New York Times (Accessed: 15 May 2015). Schon, D.A. (1980) Refection-on-Action, mimeo, Dpt. Of Urban Studies and Planning, M.I.T., Cambridge. Simon, H.A. (1969) The Sciences of the Artificial. MIT Press, Cambridge. Turner, V. (1987) The anthropology of performance. New York: PAJ Publications. THE CURSE OF TINA [WWW Document], 2011. . Adam Curtis. (Accessed 10 November 2017). Critical Practice (2017a) Critical Practice #TransActing: A Market of Values (Accessed: 24 September 2017). Social Innovation Exchange (2013) Roberto Magabeira Unger in conversation with Geoff Mulgan on The task of the Social Innovation Movement. (Accessed: 7 February 2016). Critical Practice (2017b) Utopia Evaluation. (Accessed: 26 September 2017). ArtRabbit (2016) What Happens to Us. (Accessed: 26 September 2017).